'CÁDIZ, SPAIN - Cádiz is distinguished by being the oldest city in Europe as well as its casual attitude towards tourism. Until recently, this same laid-back view prevailed westward of the city, the single exception being El Puerto de Santa Maria, famed for its riverside location and shellfish restaurants. To have regarded Chipiona as a holiday destination would have been beyond the pale. Then came Costa Ballena, three kilometres away, and anonymity was lost forever. Investors continue in keen purchase mode. Properties are still available here. Ideal as holiday homes in the sun with cities such as Seville, Jerez and Cádiz nearby, the natural park of Coto Doñana a few minutes away and Portugal two hours distant, appeal increases. Not least attractive is the area's lack of glitz. Although a few half-hearted attempts were made to create a second Costa del Sol, this coastline remains Spanish in name and nature. There is nothing small about Costa Ballena. The vast urbanization of 400 hectares was created to attract northern Europeans to sunny Andalucia. The property encompasses four kilometres of Atlantic beach and a number of low-rise apartment complexes and is well on its way to becoming a self-sufficient community with commercial centres, supermarkets and a range of sporting activities to keep the community fit. Building a golf course on such a site was mandatory, and, as it was a focal point of the estate, it was nearly finished before the property development got underway. José María Olazabel designed the main 18-hole course and a further nine holes is under construction at present. "This is more like a Florida course," commented Ballena's Scottish pro, Ian Laird. 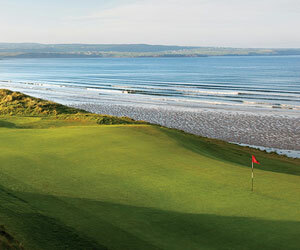 Located on the Atlantic with several links holes, the course is undeniably flat. It has been saved from being tedious by clever (occasionally diabolical) tree planting on both roughs and fairways. Various species sprouting from immaculate sweeps of fairway gives the course a faintly surreal aspect. This is more than adequate compensation for a dearth of hills. Water hazards and bunkers are in abundance; greens are spacious and sloping. "The result is that Ballena is suitable for almost any type of tournament," Laird observed. Additional to the 18-hole course is an intriguing 9-hole Par 3 course on which players hone their iron skills. Not a pitch-and-putt course, the greens are generous and each hole demands play with a different iron. Costa Ballena's training facilities includes a pitch green and long driving range. A video salon is being built, and a swing analyser is in place. The gymnasium was designed specifically for golfers. Taken as a whole, the amenities are impressive and have already attracted Scandinavians to travel down for their winter programmes. The Swedish PGA recommends Ballena as an ideal training centre. The Clubhouse or (Casa Club) was a long time in the making. We watched it going up while sheltering in the friendly but breezy tent that served up drinks and snacks in all weathers. The finished product was worth the wait: it is one of the best-appointed clubhouses in southern Spain. The same bonhomie that characterised the wind-blown tent has survived the move to comfortably elegant surroundings. Reasonably priced drinks, a good selection of tapas and eager-to-please waiters prevail. Tee times are every ten minutes and management intends to keep it that way. Marketing Director, Victor Sáez says, "It is a commercial golf club but we don't want to turn it into a factory. People must be able to enjoy the game." "I live golf," says Luis Domínguez, Ballena's head marshal. He knows the virtues and flaws of Andalucian courses and the fact that he enjoys Ballena is high recommendation. Luis is particularly fond of the 16th hole, a very short but difficult par-3. Counted among praiseworthy points is the fact that he holed out in one on 16. Holes 6,7 and 8 have a lovely configuration; the trio is among the most attractive on the course. Number 10 is rightfully regarded as one of the course's major challenges. A par-5, the approach to the green is made memorable by out-of-bounds to left and right and a score-threatening water hazard. But Hole 7 remains Ballena's toughest, bunkers and wind equally influential in terms of difficulty. Whipping in from the sea and across the flat, it is a worthy foe. The Volvo Master's Press Tournament was held at Ballena a few weeks ago. Coming in early to collect a few quotes from the likes of the Financial Times and the International Herald, I greeted golfers fresh from the pleasures of playing a round in near hurricane force winds. "I'll have a large brandy, please," was the most respectable comment I heard. Fortunately, this is not the norm; a week after the Volvo finished, play was under calm, sunny skies. If you plan a visit to Costa Ballena, consider booking into either one of the two hotels on the estate: Colón Costa Ballena or Grupo hotels Playa. Should you prefer staying in a hotel within walking distance of a Spanish village, try the Hotel Playa de la Luz (email: reserves@hotelplayadelaluz.com) or Hotel Duque de Najera (email:reserves@hotelduquedenajera.com). All of the above have discount arrangements at the golf club. Amenities include tennis courts, paddle tennis, swimming pools, etc. They are located in Rota, only a few kilometres from Ballena. Carla Harvey freelances for various magazines in Spain and abroad. Among them are Mediterranean Life, Essential, The Reporter and Lookout Magazine. She was the editor of Marbella Times for five years and WHERE Costa del Sol for two years.